Switzerland exported some 73,000 tonnes of cheese in 2018. A considerable amount of cheese – 62,000 tonnes – was also imported into Switzerland, however, 40 % of it fresh cheese from abroad. Toni’s is now challenging this dominance. Swiss consumers are only partly patriotic when it comes to cheese. While traditional cheese varieties including Le Gruyère AOP, Emmentaler AOP and Appenzeller have for many years been secure in their top spots when it comes to the cheese consumption of the average Swiss person, another cheese is out in front: mozzarella. With other fresh cheeses equally popular, fresh cheese accounts for one-third of cheese consumption in Switzerland. And most of this is imported – primarily from Germany, Italy and France. While only just under 20 % of mozzarella is imported, 18,000 of the 20,000 tonnes of cream cheese consumed every year in Switzerland come from abroad. Since Switzerland continues to produce more milk than can be consumed domestically, Emmi sees a gap here that it would like to fill. As much as consumers love their Swiss milk, different criteria apply when it comes to fresh cheese. While it is reasonable to assume that the Swiss flag would add little value to mozzarella due to its Italian roots, the strong position of foreign cream cheese is the result of years of sophisticated marketing by major international corporations. For many people, eating cream cheese automatically brings to mind images of a beret, a baguette and Provence. Emmi wants to replace these Mediterranean clichés with Swiss milk and wholegrain bread. 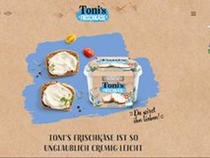 The new Swiss brand taking on the European competition is Toni’s, from Central Switzerland, and its Swiss cream cheese is available now from Coop in three varieties: original, garlic & herb and horseradish. The mild taste and creamy consistency are based heavily on successful foreign rival products. Visually, Toni’s is down to earth and Swiss but also in line with current trends. Together with the attractive price, this should help persuade consumers to change their long-standing habits.